The most renowned film event on the European outdoor calendar is coming back and with it the most spectacular sport- and adventure films of the year. Coming to the big screens. To a cinema near you! Real adventures and inspiring protagonists with an heartfelt passion for adventure and the great outdoors. 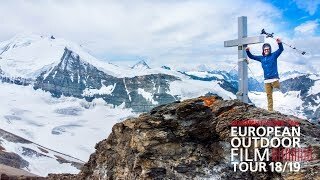 The European Outdoor Film Tour is heading to more than 300 venues in 15 countries. We are sure that it's going to be great again! Get your tickets now and stay tuned with our newsletter. A TO B ROLLERSKI shows Raimonds Dombrovski's 6700-kilometer training run across the USA. On rollerskis !!! Paraglider Antoine Girard wants to fly on the highest peaks of the Karakorum Mountains - all alone. See if he succeeds in 8000+. THE face of the E.O.F.T. 18/19: Adam Ondra! His well-toned body seems to effortlessly overcome gravity. In THE A.O. we take a closer look at the famous Czechs. In Mbuzi Dume - Strong Goat Tom Belz climbs the highest mountain in Africa, with only one leg! And you will get ice cold snowboarding and skiing action by Victor de le Rue and Pierre Hourticq in Frozen Mind. And... Jacques Houots - THE FRENCHY. The extraordinary 82-year-old leaves us astonished. We meet two very different, very ambitious alpinists in VIACRUXIS - a lovingly animated stop-motion film about the big and small disasters on the mountain. And last but not least, mountain biking at its best with Darren Berrecloth, Carson Storch, Cam Zinc and Tom Van Steenbergen in NORTH OF NIGHTFALL. Need more information? Have a look into the brandnew E.O.F.T. magazine! Evento nelle vicinanze di .